One of the great things about any Linux distribution is the ability to customise the look and feel of it to your taste. Throughout the past week, I’ve discussed software availability, compatibility and ease of use, but I haven’t gone as far as modifying the way I use it. Coming from using a MacBook Pro and its OS X operating system, I was eager to see what docks were available, as I’m accustomed to using a dock on Mac OS X. 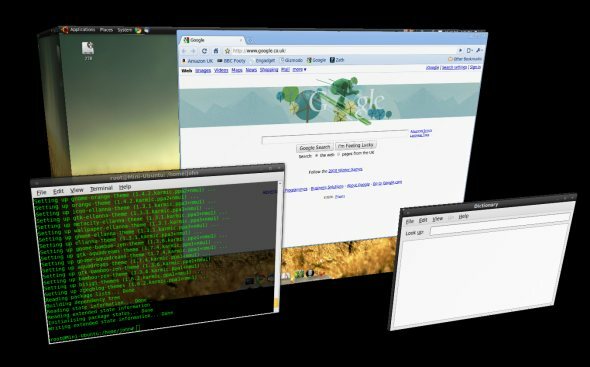 As well as modifying for added functionality, I also wanted to add a little eye candy with the help of Compiz. 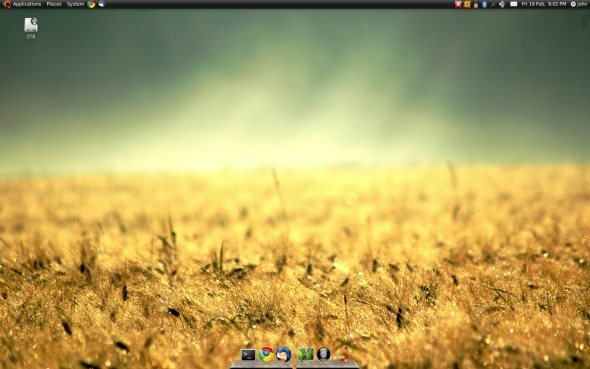 Although there are a few choices when it comes to docks for Ubuntu, I opted for the Cairo Dock. Installation was very straight forward, thanks to perfect instructions found over at pendrivelinux.com. In 5 short steps and a matter of seconds, I had a great dock running at the bottom of my screen in place of the default panel found at the bottom of the screen after installation. This can be further customised with different themes and additions to the dock so that you can make it work how you want. If you’re coming from Windows, this may be more unfamiliar to you, but it’s definitely worth checking out. Another feature I was curious to try out was the 3D cube many use on Ubuntu, although I was dubious as to how well it would work, using a Mac Mini with only an integrated Intel GMA950 GPU to power it. The results, however, turned out rather well, and offered a few nice surprises. To configure all of the visual effects, I first had to install CompizConfig Settings Manager from the repository. To do this, I just typed sudo apt-get install ccsm into the terminal, and terminal did all the rest for me. Once installed, all of the available features and effects can be accessed from System > Preferences > CompizConfig settings manager. Not only does this include the 3D cube, but also other options such as the ability to use additional effects — a personal favourite of mine was my window bursting into flames when I closed it. These may not add to your productivity, but they certainly do look impressive! Although Ubuntu looks good from the offset, I was tempted to change the theme and make it more my own. Surprisingly, this was the most long winded of the three changes I made to Ubuntu in my modifying frenzy… Quite a few posts on the Ubuntu support site, and other various guides on the web, highlight the need to add more sources to your existing source list. The sources.list file can be opened from the terminal by typing gksude gedit /etc/apt/sources.list which will open the file for you. It’s then necessary to add two lines on the end of the file with the other sources, which adds an extra source where your themes will come from. Now that all your source list is in order, you can install a whole host of themes with one simple command in the terminal: sudo aptitude install zgegblog-themes. This may take a while as the themes are quite large. My download took around 3 minutes at 650kb/s. Once these themes have been installed, they can be accessed via the appearance preferences, accessed via System > Preferences > Appearance. Many thanks to ubuntugeek.com for the terminal commands necessary to install the themes.